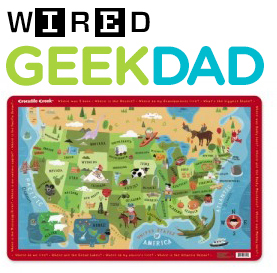 Wired Ran a quick post about Crocodile Creek Placemats and featured my USA map on their GEEK DAD Blog. Thanks Wired! I am currently working on a new placemat and puzzle due out next year. I can’t wait for everyone to see it! Stay Tuned!